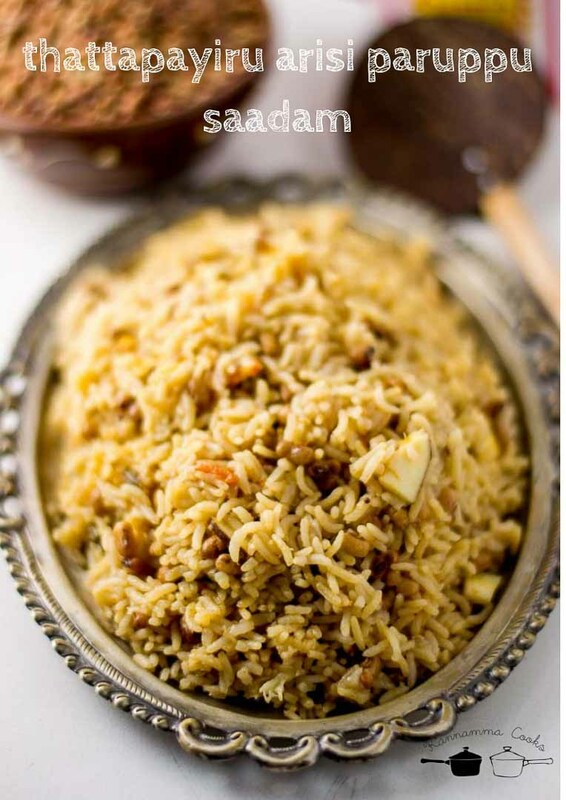 Recipe for thattapayiru arisi paruppu saadam. A very kongu style rice dish made with cow pea and parboiled rice. Recipe with step by step pictures. 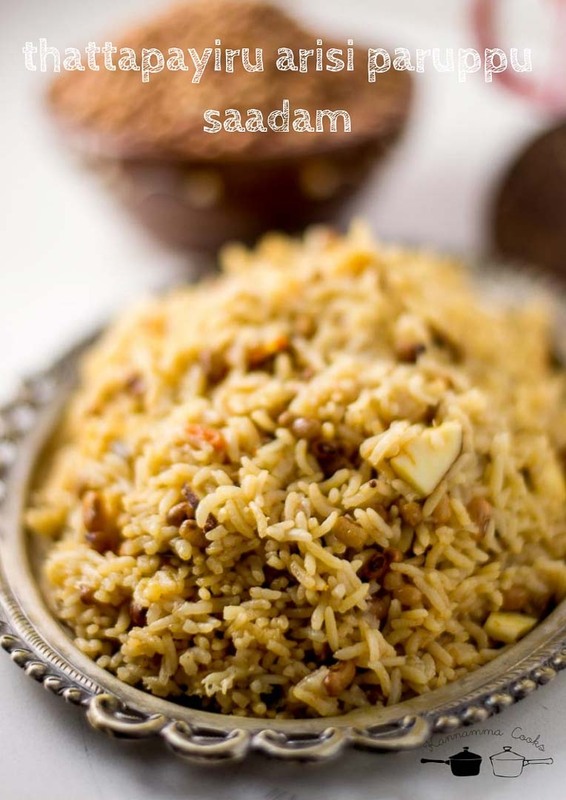 Another everyday quintessential dish from the kongu region is this Thattapayiru arisi paruppu saadam (cow pea rice). This dish is among the favorites of most households. Cow Pea imparts a very nice flavour to the rice. Parboiled rice / puzhungal arisi is the preferred rice in the region. Bits of coconut is added to the rice for texture along with onions, tomatoes, garlic and other spices. This dish is made with brown cow pea. It is fondly called as arisimparuppu -அரிசிம்பருப்பு in most homes. Thatta payiru / cow pea or black eyed pea is an ingredient very common in the Kongunadu region. 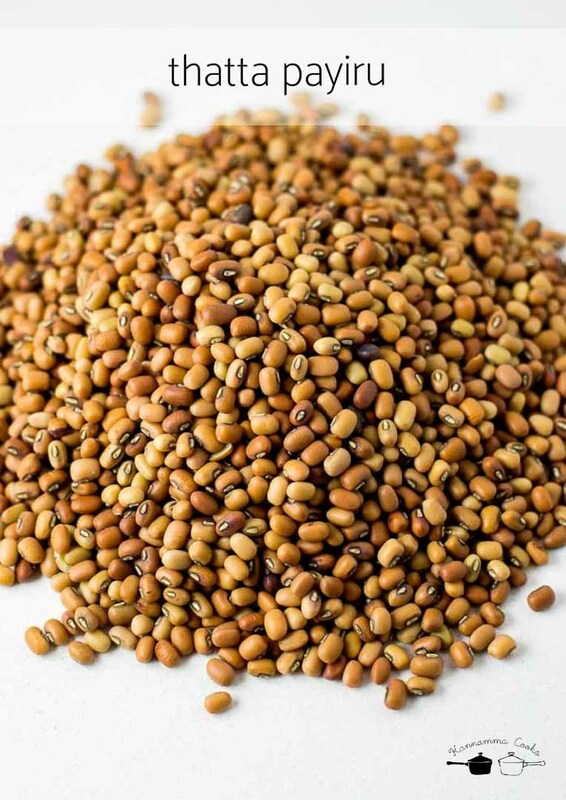 Lentils like horse gram, green gram and black eyed pea is predominantly used everyday in regions around Coimbatore (Kongunadu). Cow pea is perfect for cultivation in poor dry conditions and it makes it an important crop for arid and dry regions where many other crops fail to grow. A seed can consist upto 25% protein making it a very important grain in the region. Its also a rich source of folic acid. 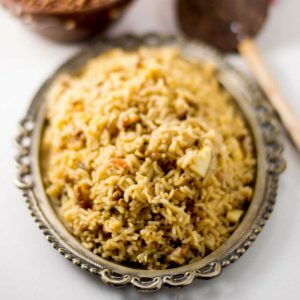 Parboiled rice / puzhungal arisi is what is used for this recipe. Soak the thattapayiru for atleast 2-3 hours. Soak the rice for one hour. Drain both the rice and lentil and set aside. 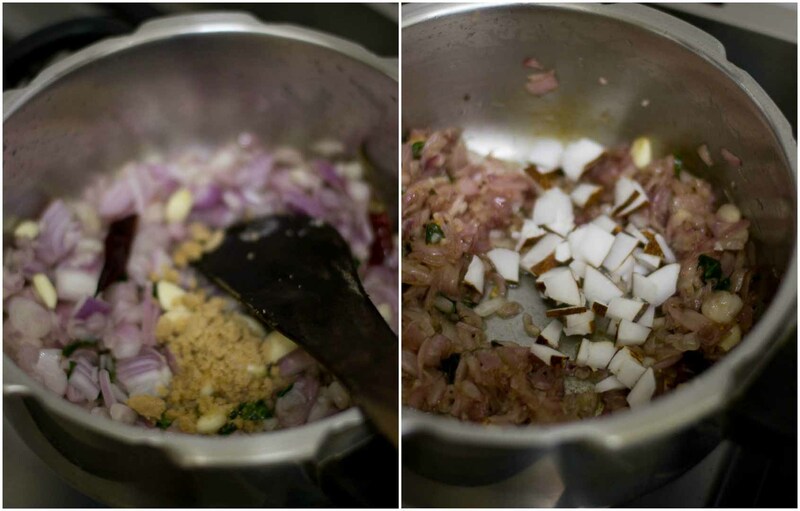 We use a combination of onions and shallots (Indian small onions) for this recipe. 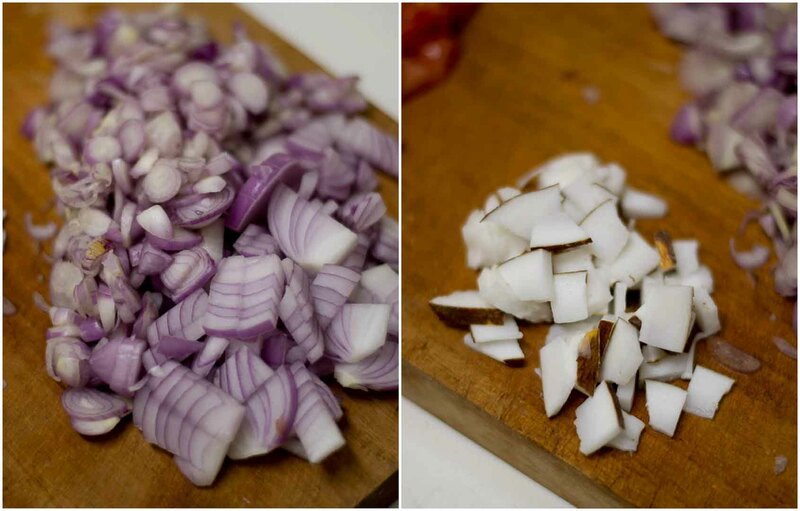 Chop the onions and shallots. Also slice the coconut into little bits. They add a very nice texture to the rice. Set aside. 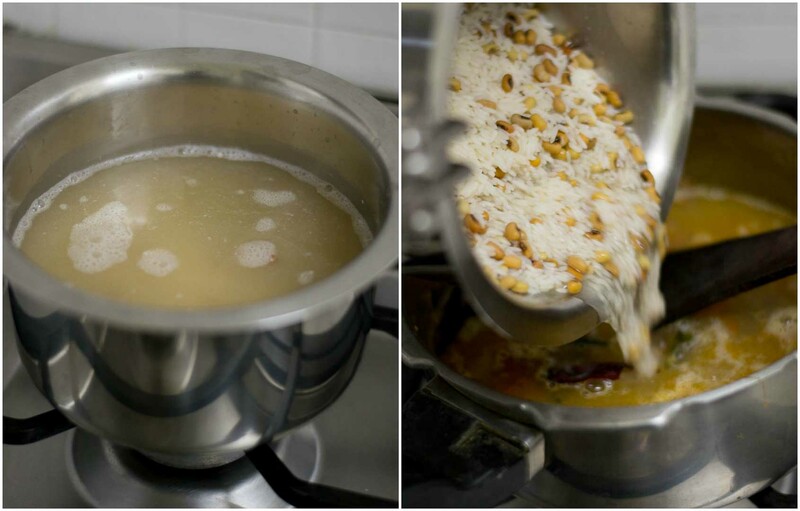 While starting to cook, add 3 cups of water to the rice and dal mixture and keep it on a low flame. 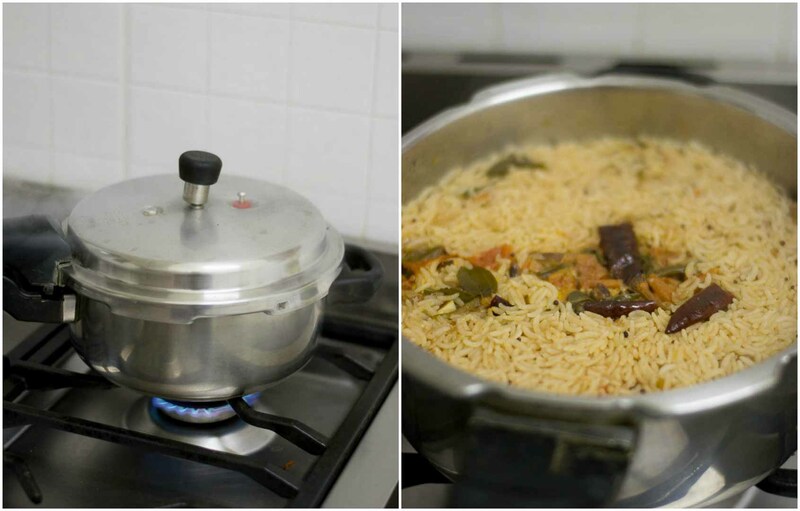 Let the rice and dal start simmering on a very low flame while we will get the masala fried and ready in the mean time. Let the flame be on low. Note: We are using 1 cup of rice and 1/3 cup of thattapayiru. For this quantity, we are using 3 cups of water for the whole recipe. Please note that down. 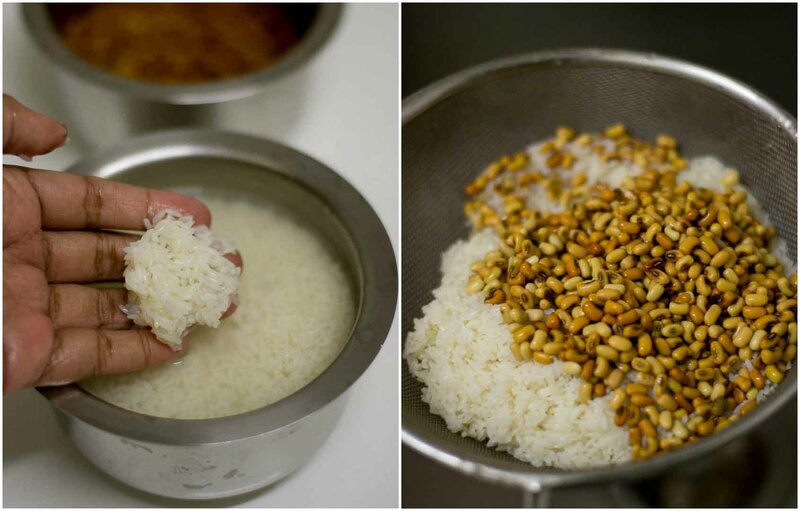 Adding extra water might make the rice very mushy and the texture will become very soft. So heads up and caution on that! Heat oil in a pressure pan / pressure cooker and add in the mustard seeds, dry red chillies and curry leaves. Add more dry red chillies (broken into half), if you want a spicy rice. Add in the onions, small onions and the garlic. Add in the salt and saute for a good five minutes till the onions are cooked well and soft. The onions will start to brown. At this stage, add in the sliced coconut pieces. Also add in the chopped tomatoes. 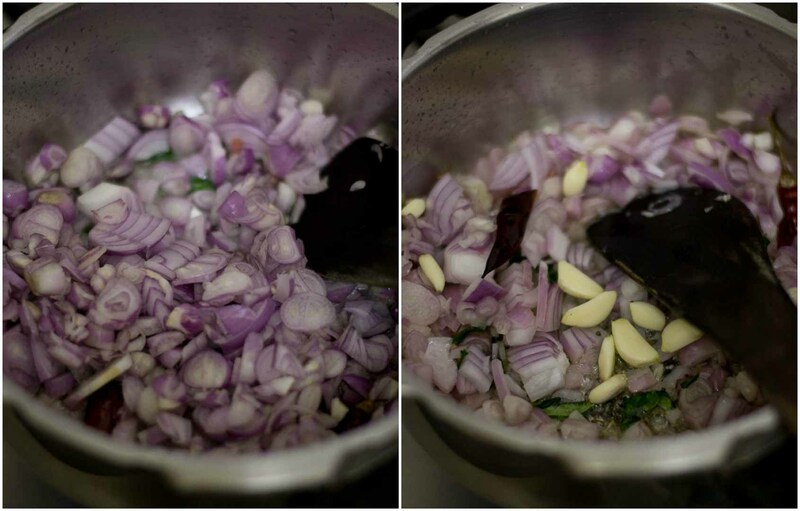 Add in a teaspoon of kuzhambu milagai thool. 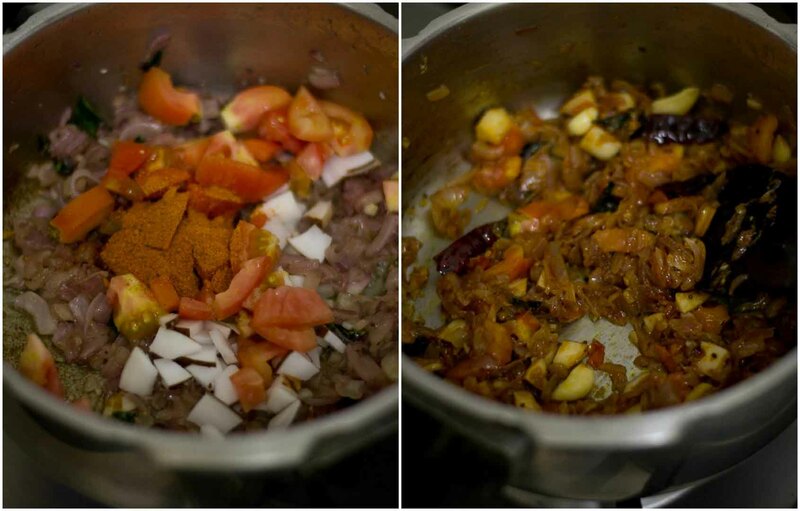 If you do not have kuzhambu milagai thool, you can substitute it with sambar powder. Saute for 5 minutes. The tomatoes will get cooked and become juicy. Add in the simmering rice along with the water to the pressure cooker. Cook the rice in a pressure pan for 3 whistles on medium flame. Remove from heat. Wait for the pressure from the cooker to release naturally. Do not omit this step! Thattapayiru Arisiyum paruppum saadham is ready to be served! This dish is always ALWAYS served with hot ghee. Just add a teaspoon and mix and enjoy your meal! Soak the thattapayiru for 3 hours. Soak the rice for one hour. Drain both the rice and lentil and set aside. 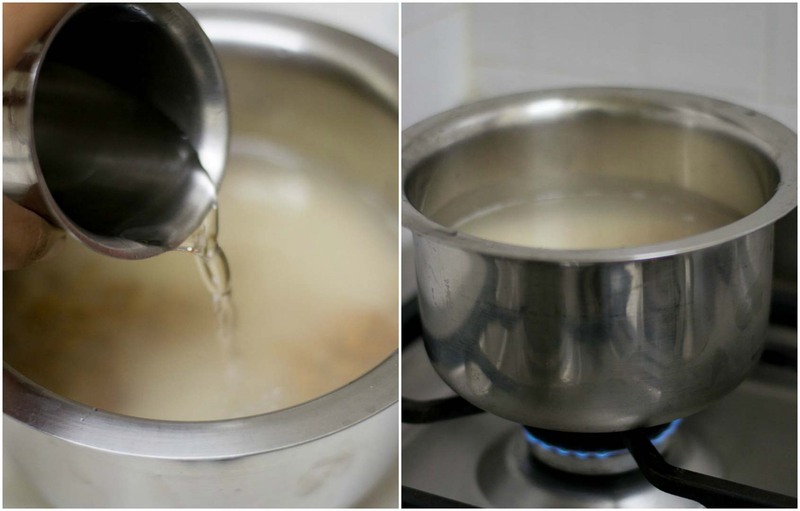 While starting to cook, add 3 cups of water to the rice and dal mixture and keep it on a low flame. 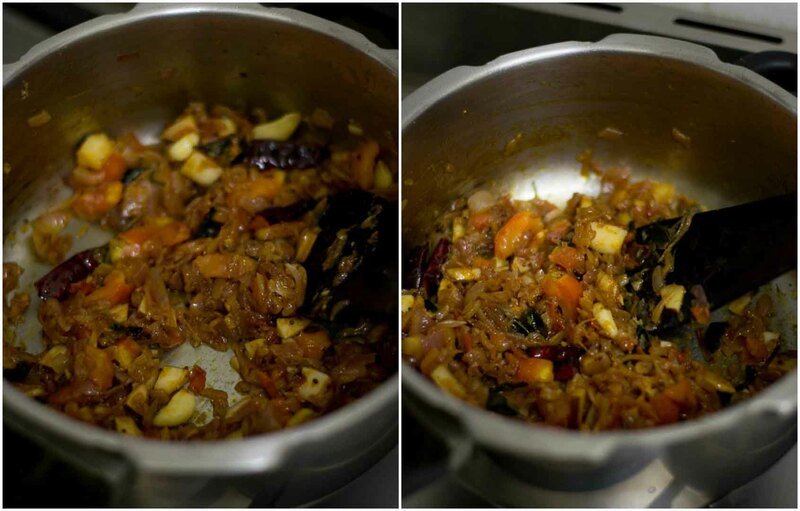 Let the rice and dal start simmering on a very low flame while we will get the masala fried and ready in the mean time. Let the flame be on low. 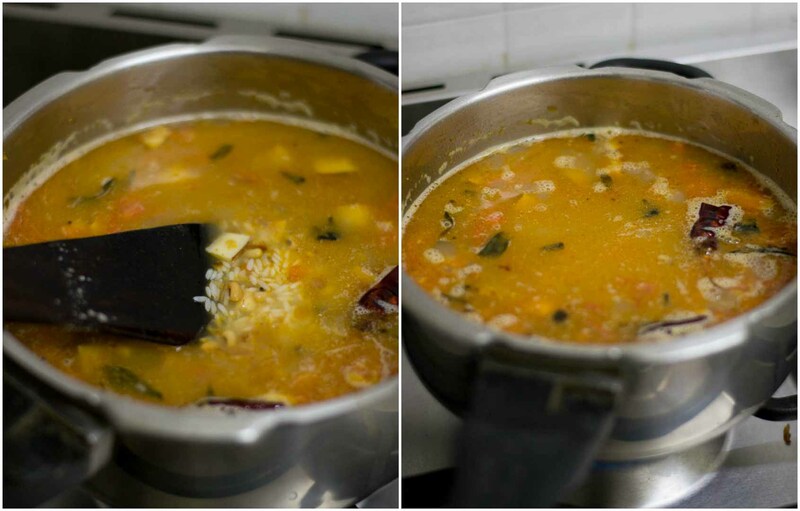 I tried your recipe for Tomato sambar. It came out well and was very tasty. One request is pls give the measurement in gms rather than cup. Or specify one cup is how many gms. Likewise water in ml. I am going to try Thattapayiru Saadham next. But qty of rice and water is not clear in terms of cup. 1 cup is 240ml sir. The standard measuring cups you get in the market will help you.